Bill Mootos, Stephanie Clayman, Steven Barkhimer and Liz Hayes in AlanAyckbourn’s ABSURD PERSON SINGULAR. Produced by The Nora Theatre Company. Now Playing through August 18 at Central Square Theater. Photo:A.R. Sinclair Photography. CAMBRIDGE — Some people dread the holidays. Oftentimes they are forced to spend time with people they actually detest, sometimes with very good reason. The bad experiences of one Christmas of Thanksgiving, for example, can piggyback and continue to manifest themselves in future holidays. In one of playwright Alan Ayckbourn’s most engaging pieces, “Absurd Person Singular,” now being given a sterling production by the Nora Theatre at the Central Square Theatre, three couples hilariously move up and down the social ladder, trading places over three consecutive Christmases, with the action all taking place in the kitchens of the couples. It’s one of the foremost examples of Ayckbourn’s use of offstage action to explain and enhance the action going on onstage. Ayckbourn always seems to delight in the ups and downs he puts his characters through, and at some point — and here it is the second act — he will ask actors to almost lose all touch with reality. In Act I, young couple Sidney (David Berger-Jones), a contractor just starting out, and Jane (Samantha Evans) are all-out to make a good impression on their guests at a Christmas cocktail party: Ronald (Steven Barkimer), an aging, wealthy banker, and his second wife Marion (Stephanie Clayman), a somewhat charming woman who slowly dissolves into heavy drink; and Geoffrey (Bill Mootos), an up-and-coming architect with a wandering eye, and his wife, Eva (Liz Hayes), an anxious woman who appears addicted to prescription pills. Both Sidney and Jane are socially inept, complicating matters when it comes to impressing the guests. Sidney would like Ronald to back one of his projects and Geoffrey to design it. Jane, a simple woman, finds joy in caring for her home and trying to please her husband, but in this case things quickly go awry, with hilarious consequences. Act II is a tour de force for Hayes as Eva. Ayckbourn pulls out all the stops, as a mortally wounded and despairing Eva, her husband’s career and her marriage flat-lining, spends the entire time first trying to finish a suicide note and then complete the deed, as she is continuously stymied as the other characters weave their way in and out of the kitchen, oblivious to what she is trying to do. Sidney is a hilarious handyman, Ronald’s good-hearted electrical work is disastrous but equally hilarious, and Jane mistakes Eva’s obsession with the gas stove as a plea for help in cleaning it. Then there’s a barking offstage dog named George. In Act III, which takes place in Ronald and Marion’s elegant but very cold kitchen, the chickens all come home to roost. Barkimer and Clayman are excellent. The multi-talented Barkimer, with a gift for physical comedy, has emerged as perhaps the area’s foremost interpreter of Sir Alan’s works, given what we saw in “The Norman Conquests,” Ayckbourn’s trilogy given an award-winning production by the Gloucester Stage Company. Clayman’s dissolution over the three acts is complete, at times hilarious but ultimately sorrowful. Hayes’ Eva spirals downward and then rebounds in Act III and Hayes make the transition with ease. Berger-Jones and Evans show great promise and can’t help but be benefit from a long run with the ensemble and under the guidance of Director Daniel Gidron. Gidron is in full control despite the manic pace of the piece, and his ensemble nails the wordplay, the precisely-timed entrances and exits and the inspired chaos of the second act, which in a theatrical sense is the equivalent of juggling several balls at once. 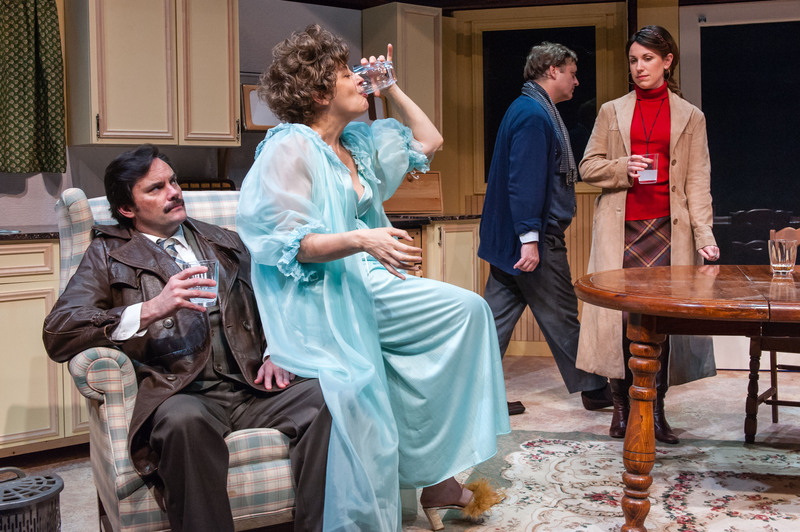 A hustling stage crew expertly transforms Brynna Bloomfield’s three vastly different kitchen sets, ably reflecting the very different worlds these people inhabit. “Absurd Person Singular” is the amazingly prolific Ayckbourn at the top of his game, and it doesn’t get much better than that.